After you go treasure hunting and gather your finds, here are some great tips for cleaning whatever you find. To start, make sure that you do not clean old coins that you believe are valuable because this will decrease their value by half! The best way to clean old silver coins is to wet the coins and dip them into baking soda, then use a toothbrush. Silver coins have the ability to tone (suffer surface damage) and tarnish as a result of silver molecules interacting with elements of the environment. If you clean a silver coin to remove tarnish or toning, you will damage the surface of the coin. The "dip" method is considered the least damaging and consists of dipping the coin in a solution for a period of time and then washing it off. 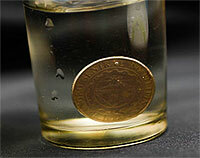 The ammonia method is similar and works for both silver and gold coins. 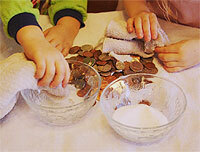 Place coins in a jar filled with ammonia, let them sit for a while, and then polish them with a cloth. If you want to remove the tarnish or toning and do not mind damaging it, you may use an abrasive cleaner such as a paste or a cream that rubs into the coin’s surface until you have removed all the toning or the molecular layers of the coin’s surface. To make your copper treasures shine brilliantly, place the coins in a half gallon container (such as apple juice container) and fill past the coins with white vinegar. Shake the container and leave overnight, but make sure to rinse them the next day. There are fantastic products available to aid you with cleaning your treasures. BLITZ jewelry cloths already have polish in the cloths. They are two pieces of soft cloth sewn together in the middle, with one for buffering and the other for cleaning. Blue Magic Metal Polish works on gold, silver, chrome, aluminum, brass, copper and stainless steel. Put a small amount on a soft cloth and rub until a black film appears then buff off with a clean cloth. One trick used by archaeologists is to soak the coins in distilled water and place them in the freezer. The coins will not be damaged because the water penetrates the dirt and the ice crystals expand breaking the dirt. It might take a few repetitions of the process to break the dirt apart, but it is worth trying. Many silver coins and nickels come out of the ground with black tarnish, so using the Mayors Cleaning Method is important here. Take a sheet of aluminum foil with Arm & Hammer washing soda, and then fold the foil into a 2-3 inch strip. After placing it to the bottom of the container, put the coins on top of it and place a few tablespoons of washing soda over the coins. You need to pour about an inch of boiling water, until the coins are covered and then after the fizzing, take the coins and rinse them.